Since 2006, CPNV and partner organizations have collaborated in the annual celebration of Saint Marcellus, a Roman Centurian who upon becoming Christian gave up the sword. The saint’s feast day is October 30, and the annual event on that day includes a service at the Sacred Heart Basilica at the University of Notre Dame, where the relics of St Marcellus are housed, and various opportunities to reflect on the foundation of Christian nonviolence. Come together with others for a simple supper and dramatization of the trial of Saint Marcellus by area youth. Process together from Olivet AME Church to the Basilica of Sacred Heart at Notre Dame. Gather for a prayer for peace and address by Fr. 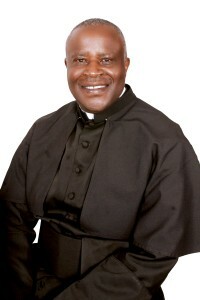 Emmanuel Katongole [http://emmanuelkatongole.com/] in the Lady Chapel. Join in a Lucernarium prayer to mark the Vigil of the Feast of Saint Marcellus which will be celebrated at Moreau Seminary Chapel (1837 Moreau Dr.) and followed by a light reception hosted by the Congregation of Holy Cross. For more information contact Sharon Kniss at info@cpnv.net or Shawn Storer at staff@catholicpeacefellowship.org or 574-339-1100. Click here for event flyer. For those who participated in St. Marcellus Day 2015, give us your feedback here. Founder of Wi’am, the Palestinian Conflict Resolution Center, in the West Bank. A well-known peacebuilder, Mr. Zoughbi gave the keynote speech with a response from Prof. Atalia Omer of the Kroc Institute (Notre Dame), and music performed by the Goshen College Women’s World Music Choir. The evening began with a pilgrimage, followed by a prayer service, and meal accompanying the keynote speaker. Founder of the Center for Christian Nonviolence and a life-long scholar and activist. Fr. McCarthy co-founded Pax Christ-USA with Dorothy Day and was the founder and director of the University of Notre Dame’s The Study and Practice of Nonviolent Conflict Resolution. Director of Romero House Community for Refugees, and Adjunct Professor, Regis College, University of Toronto, Ph.D. Philosophy of Religion. Internationally known retreat and spiritual leader who has authored numerous books. Founder, Center for Action and Contemplation and the New Jerusalem Community in Cincinnati. Internationally known American Catholic priest, Christian pacifist, author and lecturer. He has been arrested over 75 times in acts of nonviolent civil disobedience against war, injustice and nuclear weapons.